An affirmation of missions was a major theme of this year's All-American Council which was punctuated by the commissioning of the Moore Family who are exploring long-term missionary service in South Korea. From July 23-27, the Orthodox Church in America held their 19th All-American Council. Representatives from many Orthodox jurisdictions were present, including the Church of Finland, the Ecumenical Patriarchate of Constantinople, the Greek Orthodox Archdiocese of America, the Patriarchate of Alexandria, the Church of Russia, the Church of the Czech Lands and Slovakia, and the Excharchate of the Ecumenical Patriarchate of the Parishes of the Russian Tradition in Western Europe. This wonderful global turnout led to a very fruitful week of discussions. Very encouraging, however, was the fact that the Church’s responsibility to participate in missions and evangelization was not only mentioned in Fr. Martin’s presentation, but was a recurring theme in talks throughout the entire council. That served as a good reminder that missionary work is, at some level, an intrinsic part of every Christian life and ministry. This emphasis on missions was even manifest directly, when the entire body of the council gathered to commission the Moore family at the end of the Divine Liturgy, as they begin exploring South Korea for the next phase of their missionary service. 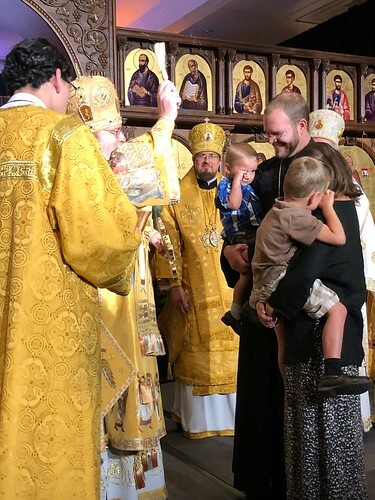 With representatives from Orthodox Churches all around the world gathering to bless the Moores and send them off, a true icon of missions in the Church was portrayed.